Just when we thought the slaughterhouses couldn’t get any worse for workers, consumers and animals alike, new rules are coming out of Washington DC that will make the whole situation worse than ever. Under the “Modernization of Poultry Slaughter Inspection” rule, a processing line could run at 170 carcasses per minute, and only one inspector- employed by the company that owns the processing plant- would be required to be on duty. The new rules do not even mandate training for these company inspectors, whereas USDA inspectors undergo extensive training to allow them to fulfill these tasks under the current inspection system. “These rules essentially privatize poultry inspection, and pave the way for others in the meat industry to police themselves,” said Wenonah Hauter, executive director of Food & Water Watch. With most meat inspectors replaced by untrained slaughterhouse employees, and the kill rate increased to almost 3 chickens a second, it is virtually impossible to do any reliable testing. The USDA’s Food Safety and Inspection Service says that this proposed rule would provide the framework for action to provide public health-based inspection in all establishments that slaughter amenable poultry species,” according to the rule’s official summary. However, reduced inspections make contamination with disease-causing bacteria all the more likely. With the kill rate higher, worker stress is likely to get worse. Working in a slaughterhouse is already one of the most dangerous and stressful jobs in the country, as we’ve explained in a previous posting. Last but surely not least, a higher kill rate is very likely to make matters even worse for the chickens. Many people are surprised to learn that unlike the very minimal legal protection that cows have, chickens have no laws to prevent cruelty at all. As the saying goes, if slaughterhouses had glass walls we’d all be vegetarians! We can only hope that the USDA reconsiders the new rules. In the meantime there’s something you can do. 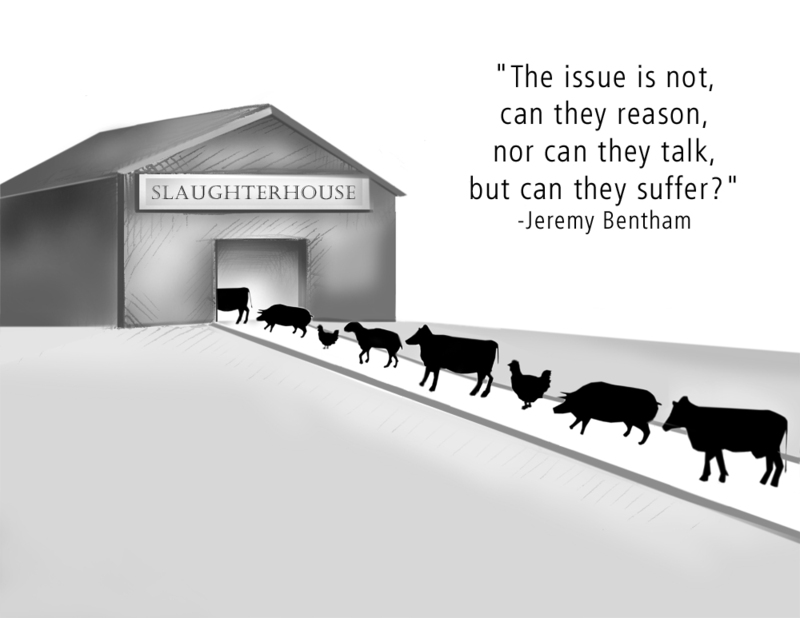 Year after year the slaughterhouses continue to get worse and worse. The best solution to this problem is the vegetarian solution. By following a healthy diet composed of fruit, vegetables, whole grains, beans and other legumes and nuts, you’ll be reducing the demand for chickens until, someday, there won’t be a need for any of them to be killed.